Happy Thanksgiving to all of you in the US!! Brenda here with you. I hope you have a Thanksgiving filled with family, friends and lots of good food!! With Thanksgiving also comes the official start of holiday shopping & Black Friday!! Trinity has some awesome freebies and sales that start today and go on all weekend!! 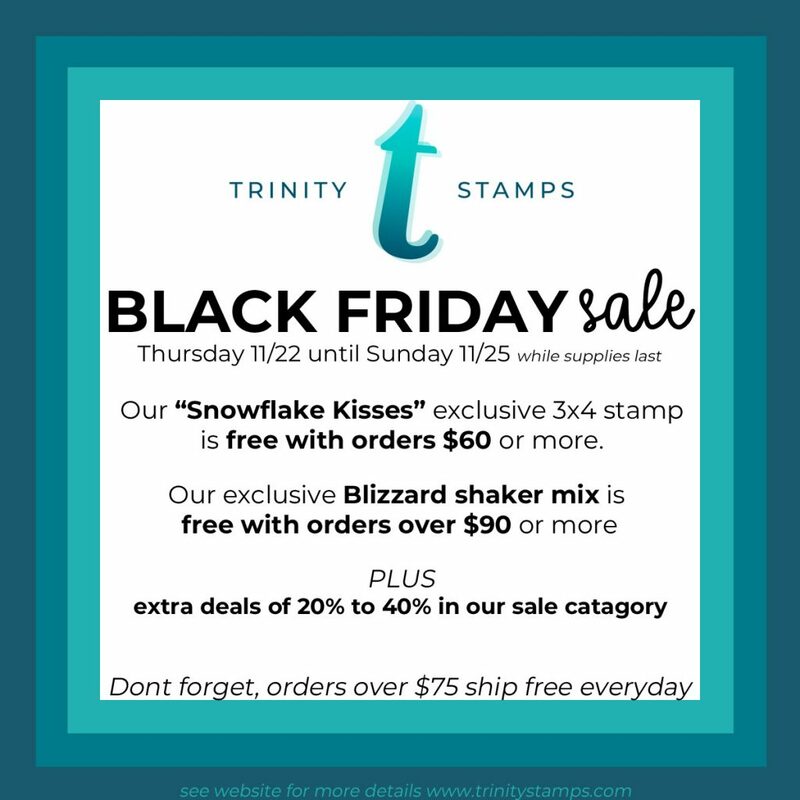 Today, I am sharing a card using the Snowflake Kisses stamp set that is free with orders of $60 or more! I just adore this sentiment! The Snowflake Kisses stamp set is large enough to stand on its own, but I wanted to combine it with a die set from the recent release to create a larger card. I began by die-cutting a scalloped rectangle panel from Bristol Smooth cardstock and ink blending Salty Ocean, Blueprint Sketch & Chipped Sapphire Distress Oxides onto it to create a night sky. BREAKING NEWS…Trinity just received their first shipment of brand new Trinity Blendability Brushes!! They blend Distress Oxides like butter!! There is also a Trinity Tri-me Travel Blending Brush!! So exciting and affordable!!! I splattered on some water and a mixture of Perfect Pearls and water onto the background panel and set it aside to dry. I cut the oh-so-cute deer and trees with the Joyeux Noel Dies from white cardstock and stacked them together. I also cut the trees and deer from some white iridescent glitter paper and adhered them on top of the layered white die-cuts. (I wish you could see all of the sparkly goodness!) I also die-cut some snow drifts with the scalloped rectangle dies and hand cut some hills from the glitter paper. 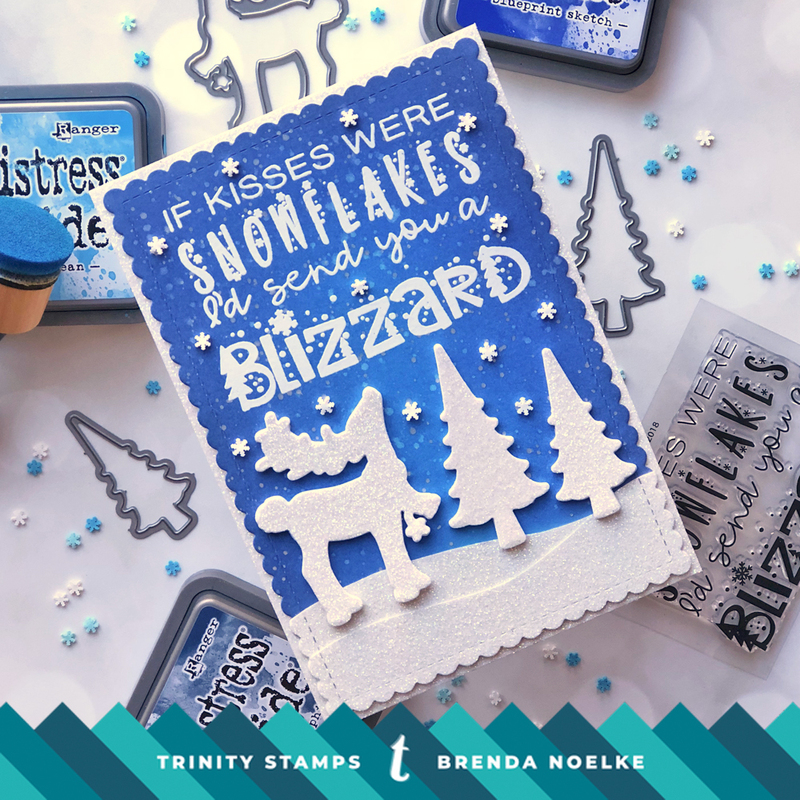 After the ink-blended panel was totally dry, the Snowflake Kisses stamp was stamped with Versamark and heat embossed with white embossing powder. The panel was adhered to a piece of white glitter cardstock that was cut slightly larger than the scalloped rectangle. The glitter hills and stacked die-cuts were adhered at the bottom of the panel. A sprinkling of white snowflakes from the Sprinkles Frosty Snowflakes Sprinkle Embellishments Mix was the perfect finishing touch! That’s it for my project today!! Be sure to head over to the Trinity Shop to take advantage of all of the sales and promotions going on throughout the weekend!! Sooo pretty, I love that snow!